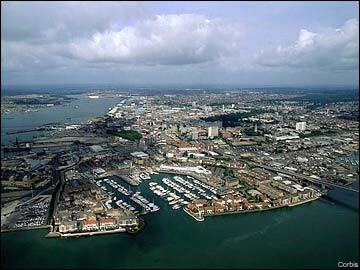 Southampton is a major port approximately 80 miles southwest of London. England's currency is the British Pound (GBP) though England's version is called Pound Sterling. Though not expected, a small tip (5-10%) is appreciated when eating at restaurants or taking a taxi. Though all cruise terminals can be accessed without going through port security, shuttle buses are not provided and there is no public transport available. You will need to arrange private transport or take a taxi to the terminals. See the Dover section for London sights. WestQuay is the largest and newest mall in the area. There is a large Asda discount supermaket behind Marlands Mall north of WestQuay. Above Bar is the main shopping street. High St and the surrounding area have shops and restaurants. The WHSmith bookstore on the short pedestrian section of Above Bar St has a post office. Cafes and restaurants may provide free wifi to customers. There is a Costa Coffee behind Bargate on High St, McDonalds in the WestQuay Mall food court, and Starbucks on Above Bar by the entrance to Marlands Mall.